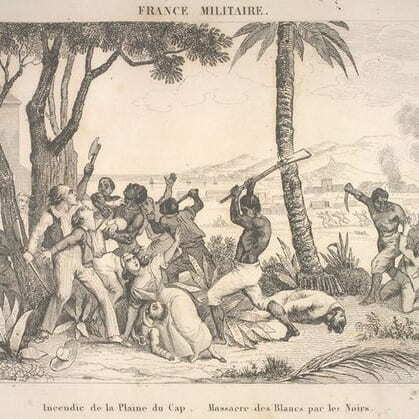 Violence was a prevalent and essential portion of both the French and Haitian Revolutions, and the methods practiced and reasons for it being utilized had some distinct similarities. We will focus on these similarities, here, so that we may engage in a discussion of the role of violence in these two revolutions. In order to understand why members of both societies embraced violence as a form of political action it is necessary to identify the reasoning which led these people to practice such extreme tactics. There are significant reasons that existed during these revolutions that are easy to identify but, there are also some reasons that have been introduced by historians as related, nonetheless, these reasons are purely speculative as to if these actions actually lead to any type of violence taking place. The three topics which will be addressed are religious persecution, changes in political structure and deprivation of human rights. These reasons that we wish to discuss are not all inclusive as to the extent of the reasons that took place during both of these revolutions. Since the reasons that we plan on addressing are extremely specific, we will discuss each reason within a specific context to get at the heart of why each may have provoked violence. Of the variety of reasons that have been hypothesized for the reasons for the violence behind the French Revolution, the idea that religious reasons for violence may be something that people are hesitant to accept. Although a long shot, sacrificial ideas and wand rituals were very crucial for converting a nation who were so used to being royal subjects to becoming republican citizens. Sacrificial violence that was practiced in the French Revolution was influenced by Roman and Christian traditions of sacrificial activity, in particular, scapegoat and martyr. Some of the traditions that were focused on were the affinity and connection to religious scapegoats from the story of Junius Brutus and the Judeo-Christian narrative of sacrificial expiation. 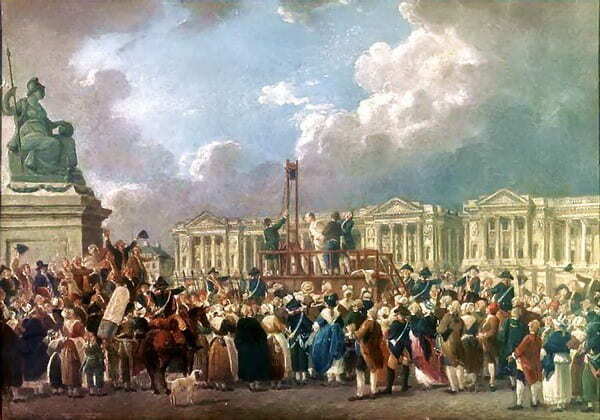 Furthermore, into the religious influence upon the violence in the French Revolution, the decapitation of Louis XVI was one particular example of religious influence. “The youngest of the guards, who seemed about eighteen, immediately seized the head, and showed it to the people as he walked round the scaffold; he accompanied this monstrous ceremony with the most atrocious and indecent gestures. At first, an awful silence prevailed; at length some cries of ‘Vive la Republique!’ were heard. By degrees, the voices multiplied and in less than ten minutes this cry, a thousand times repeated, became the universal shout of the multitude and every hat was in the air” (Edgeworth). 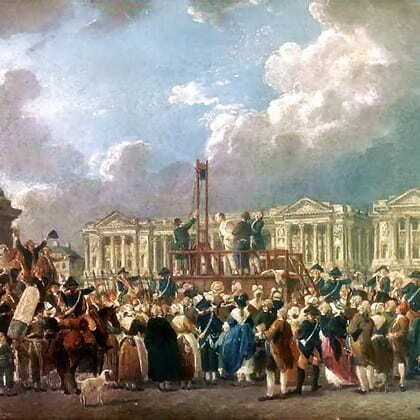 The French understood the king as the head and the people of France were the body, by decapitating the head and putting it on a pike, the “head” of the state belonged to the people. Furthermore, in the monarchical society, Louis XVI represented God to the rest of French society, as with every other French king before him. The French monarchy ended the way it began, with a metaphorical baptism: the French first became royal subjects when Clovis was baptized with holy water and became republican citizens when the new republicans baptized themselves with the King’s blood (Costa). Due to an overwhelming debt that was threatening to devastate France, there were a number of different political bodies that emerged from 1789-1799. The first was the Estates General in 1788 which was established to help consolidate ideas on how to fix the massive amounts of debt. In 1789, an underrepresented faction of society, known as the Third Estate, decided to present itself as the National Assembly which eventually took control over almost all politics in France until 1791 when the Legislative Assembly opened. 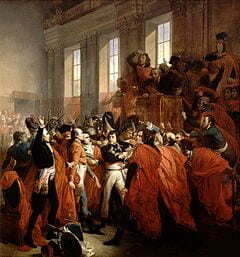 In 1792 the Legislative Assembly was changed and it took the form of the National Convention which was a group of male citizens that were elected to hold office to uphold the revolutionary ideals and to attempt to remain in control of France due to impending war with most of Europe. 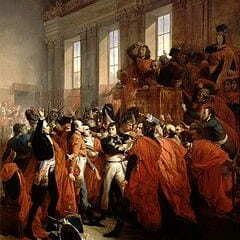 In 1793, the Revolutionary Tribunal was created which stripped the vast majority of rights from the citizens of France. Lastly, Napoleon Bonaparte’s coup of 18 Brumaire, in 1799, was where the rule of France was split into basically another monarchy with the head being Napoleon himself (Hunt). The changing of political structure severely disrupted the societal norms of what was an acceptable practice throughout the country. The laws that were constantly changing discouraged the common citizens of France and due to the loss of rights and the overwhelmingly controversial enforcement of some of these laws, some of these citizens embraced the only thing that they could to help them improve the situations that they had to deal with in their streets, violence. 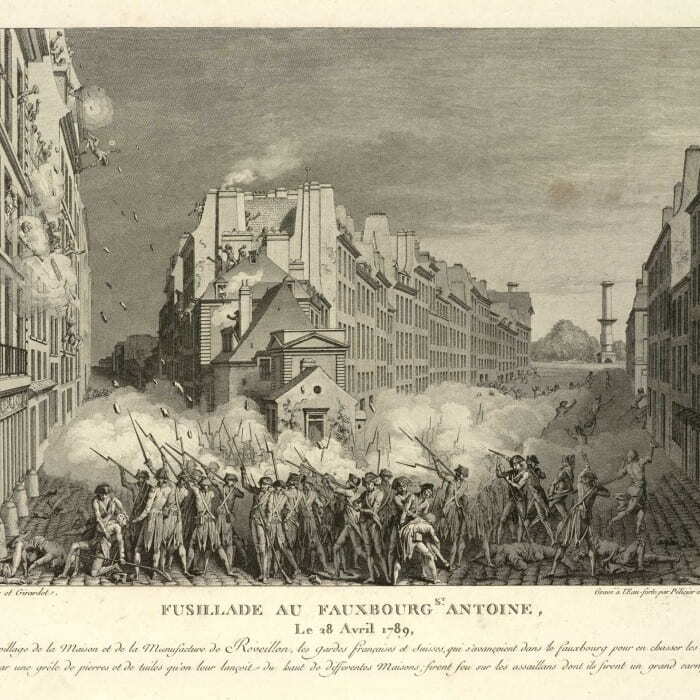 In France during the Revolution, there were a multitude of different types of riots and revolts that took place for a multitude of different reasons but, the most common was the fact that people were unable to live with the basic necessities and rights that were being promised to them. We are going to focus on three specific occurrences but they are not inclusive of all the revolts and riots that took place during the French revolution. These three occurrences were chosen because they relay the ideals behind different types of revolts, specifically rioting due to pay, riots evoked to help the citizens defend themselves and food riots. The Reveillon Riots (April 23-29, 1789) was the earliest form of insurrection against a figurehead, the reason for these riots is because there was a speech held that indicated that wages were too high and that people could live off less livres (money) like they used to previously. 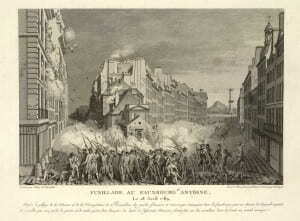 The Reveillon Riots have been called by some historians as the first manifestation of the French Revolution (Rude 35). 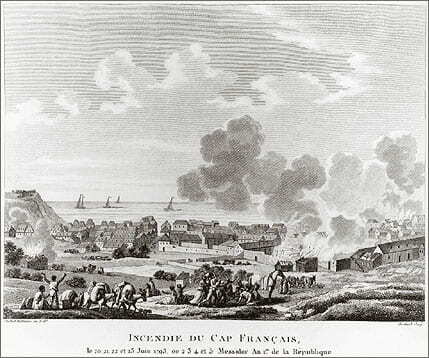 The Taking of the Bastille on July 14, 1789 happened for a couple of different reasons. Mainly the citizens of France were attempting to obtain weapons and armaments to protect themselves but, the symbolic effects of destroying the concept of ministerial despotism was far more successful (Rude 53-54). Another popular reason that there were riots was because of the food shortages that were taking place because of the severe weather that had destroyed most of the crops across France. In August, 1789 there were a number of different outbreaks of violence, one being the Chatel massacre and another at the Hotel de Ville on Aug. 8 (Rude 67). Throughout the island of Saint Domingue, slaves were thrown into new communities and forced to conform to the ideals of those who now oppressed them. One of the few ways that slaves attempted to create an identity for themselves was by creating a religion that everyone could adopt and embrace as their own. By doing so, this would lead to a commonality amongst the entire slave population making them feel as if they belong and helping them embrace commonalities amongst their peers. The major religion that these slaves adopted was Vodou which was an extensively practiced religion in Saint Domingue during the Haitian Revolution and still continues to this day. 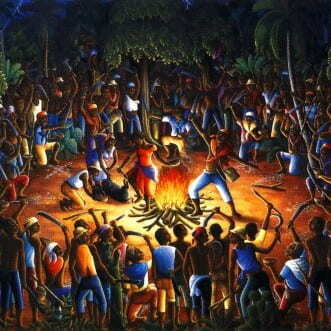 Among the African rituals and customs described by Moreau de Saint–Méry, none terrified white planters more than the practice of vodou which was perhaps one of the greatest and most dominant tools of resistance (1-2). 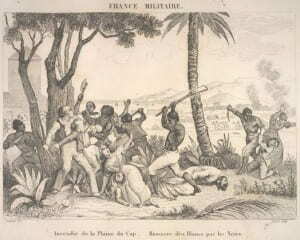 French planters understood that by having slaves, free blacks and gens de couleur (mulattoes) united under a specific religion could weaken their expatriate influence and supremacy. 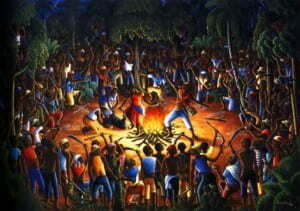 It has been speculated that by embracing this religion as their own, the slaves and practitioners of the voodoo religion were able to congregate around ideals that ultimately lead to these individuals utilizing the concepts presented in their religion, they were able to adapt the ways in which violence was perceived and even possibly inflicted. The most important vodou ritual that is described in literature is the Vodou Ceremony that was performed by Bois-Caiman on August 14, 1791, this ceremony took place roughly a week before the revolution began and was attended by an estimated 200 people (Smith, 40). 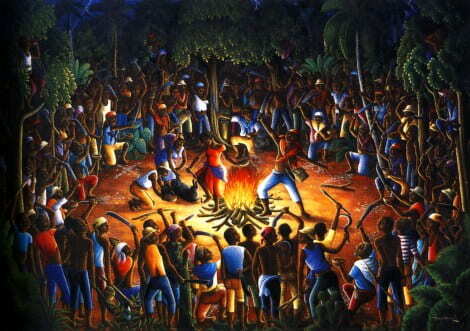 With the establishment of the Constitution of 1805 by Dessalines, the exercise of the vodou religion was banned (although this was rarely, if ever recognized and instituted) (Rodman, 67-68). There are very few sources relating to the practice of vodou and its interwoven connections with the Haitian Revolution mainly because Haitian traditions are generally passed orally. Due to this tradition it is hard to speculate exactly how influential the religion was and how well it was integrated into different aspects of the revolution. But, there are documents that do describe the use of the vodou religion as per the aforementioned ritual performed by Bois-Caiman. From your prior knowledge about vodou, and what you have learned about vodou from above, why do you believe vodou was largely unpopular except by those who practiced it? A major influence behind the violence during the long Haitian Revolution was the politics of the colony itself, and the makeup of the Saint Domingue society prior and during the Revolution. The root of the problem of the politics in Saint Domingue was the French making decisions for the people of the colony, free or enslaved. The French were making the decisions for the Saint Domingue people, in particular, the French society was split up by socioeconomic class distinctions but made the decision to split up Saint Domingue, politically and economically by the color of the person’s skin. The political system in Saint Domingue, was a hierarchy determined by race and occupational relationship to a plantation, of course meaning that the enslaved people were automatically put at the bottom. Because of this completely different makeup of the two obviously different societies, the path of the Haitian Revolution took a very different path in comparison to the path of the French Revolution. The idea of race and color was very much accentuated in Saint Domingue, making it a more prominent and important piece of fuel to add to the fire of the Haitian Revolution (Knight). Riots and revolts were obviously another piece of violence within the Haitian Revolution, and there are, of course, a variety of reasons as to why the violence took place. In particular, in August of 1791, the enslaved people pronounce their struggle against slavery, and of course the people who enslaved them. This beginning was well organized and strategized over several weeks and kept a secret. The first thing done, was the burning of the plantations, especially in the Northern part of the colony. Although the events that took place in Saint Domingue was detrimental, the destroying of the plantations was very symbolic to the enslaved people who were fighting back. The destruction symbolizing the enslaved destroying what had previously destroyed them—slavery, and these plantations represented their repression and by setting plantations on fire, the enslaved were physically freeing themselves from their status in Saint Domingue (Higman). The idea that the Revolution taking place in France provided influences that led to concepts that helped shape the Revolution that took place in Saint Domingue is highly debated. 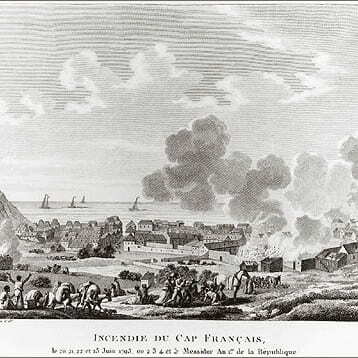 The information that was provided helped distinguish similarities that occurred in both revolutions. However, the overlap of concepts does allude to the idea that the French Revolution did impact the Haitian Revolution. Of the reasons discussed above, which do you believe was the most influential to cause violence? Why do you think that those who were causing and participating in violence in both the French and the Haitian Revolutions needed some sort of reasoning to back up what they were doing? Why could violence alone not be justifiable?